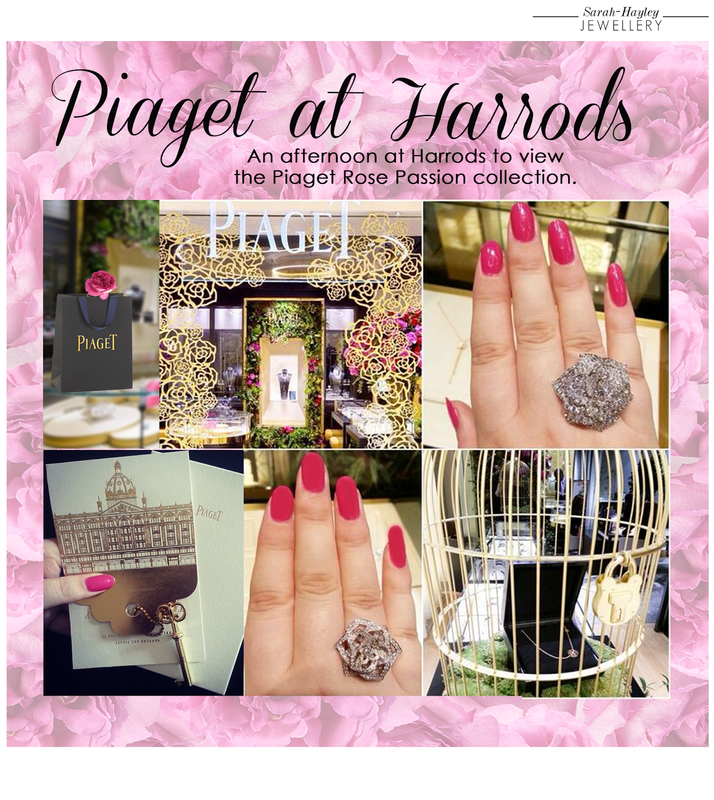 I was thrilled to receive an invitation to peruse Piaget's Rose Passion collection at Harrods in June. The beautiful foil-blocked gold invitation included a lucky key attached to the bottom. The invite revealed that the event was not only an opportunity to see Piaget's striking jewels, but there was also a chance to win a Piaget necklace if my lucky key unlocked the golden cage within the Piaget Rosary on the ground floor. Unfortunately I didn't hold the winning key although the experience was totally enjoyable as I spent the time wearing the most dazzling of diamonds. I firstly slipped on the Piaget Rose ring, (middle photo) which is in 18K white gold, set with one brilliant-cut diamond (approx. 0.1 ct) and 153 brilliant-cut diamonds (approx. 1.02 ct). The sparkle was radiant and I didn't want to take it off. However my next option was the biggest of Piaget Rose rings, (photo top right) set in 18K white gold, set with 112 brilliant-cut diamonds (approx. 2.38 ct). I concur diamonds are definitely a girl's best friend! In this short video you can see how the artisan jewellers of the Piaget workshops take great care and attention when creating the fine jewellery creations. Each part of the rose ring is crafted separately before being assembled to ensure the ring resembles a real rose. The petals are cut out from a gold plate and bent into shape one by one. To ensure every last diamond is illuminated in all its glory, the jeweller uses a “honeycomb” technique to punch the back of each petal at the spot where each gem is to be inserted. Each part of the flower is assembled from the inside out, working from top to bottom. From the inside out, the Piaget Rose holds the secret to its generous proportions. Creating shapes alike the large, Peony-like blossoms of the 'Yves Piaget Rose'.